Laibach, as they themselves state in WAT, are no ordinary band. They issue manifestos instead of giving interviews. Their latest album, Volk, is a thoughtful and analytical collection of covers of national anthems. It is decorated with a lovely painting of sheep and is not to be confused with their last album, which was a greatest hits package entitled Anthems. In the past they have also given us Let It Be (a re-recording of The Beatles' album), Sympathy For The Devil (an album made up of different interpretations of The Rolling Stones' track) and an exploration of Christianity in Jesus Christ Superstars. Their version of Europe's Final Countdown has to be heard to be believed, and you haven't lived until you've heard Milan Fras singing Queen's One Vision in German. Cheese into gold. Live, they are something else. Dressed in black and drilled with military precision, their industrial/ dance assault is awesome. And then there is the terrifying, Rapsutinesque figure of Fras and his bass rumble of a voice that resonates inside the listener. All this brings us to the Divided States Of America DVD. There is a complete live concert recorded in Paris in 2004, and very fine it is too. This on its own would have been a fitting release for the band, but it is a bonus feature. The main meat is Sašo Podgoršek's documentary of Laibach's American tour of the same year. At first Mute seem to have got the items in the wrong order. The documentary starts out like a bonus feature. You know the sort of thing: shaky, handheld camera shots of various city sights, interviews with punters, incomplete and poorly recorded gig footage. It seems a one-viewing-only type of item. However, it gradually becomes apparent that there is much more to it than at first appears. This was the year of the second George W. Bush victory, and the Laibach tour is covering the democratic heartlands, starting off in Washington D.C. on the day after the announcement of the election result. Most of the interviewees, drunk or sober, are gutted (or at least annoyed and embarrassed) by the result. Laibach, one gets the feeling, allow them to feel castigated. Laibach themselves do not comment on anything during the film, although statements (either bafflingly Orwellian or dryly hilarious) appear on screen now and again. There is, spliced through it, a dressing room interview from a local journalist. However, it is edited in such a way as to allow us only the questions. This is all part of the film's angle. The interviewer is attempting to project his own preconceptions of the band onto his interview. 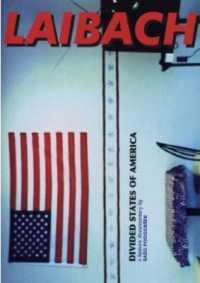 And Laibach are a band that deliberately leave themselves open to many interpretations. Their consistent use of futurist and social realist artwork and imagery has often led to accusations of both extreme right and leftwing sympathies. There is even an interview with a 'national socialist' who turned up at one of the gigs and was disappointed to find that Laibach do not share his views but who had a good time anyway and appreciated their use of artwork. For the record, there are interviews with a very wide cross-section of the American people. Most classes, races, creeds and sexual orientations seem to make an appearance. As we don't hear what they were asked, their answers and statements are largely decontextualised to fit with the trajectory of the film. Everyone seems to understand what the group are saying, even if many admit that they were confused before that night's event. Then, towards the end, there is film of NSK activist Peter Mlaker's opening statement to prepare the audience for the main act. Looking for all the world like an East European apparatchik about to give a statement on tractor production, he then proceeds to tear America to pieces while some taped Strauss plays softly in the background. One can see why the tour avoided the midwest and the south. Liabach. They take humour seriously.